Explosive eruptions produce a mixture of volcanic ash and other fragments called tephra, rather than lava flows. The word lava comes from Italian, and is probably derived from the Latin word labes which means a fall or slide. The first use in connection with extruded magma (molten rock below the Earth's surface) was apparently in a short account written by Francesco Serao on the eruption of Vesuvius between May 14 and June 4, 1737. Serao described "a flow of fiery lava" as an analogy to the flow of water and mud down the flanks of the volcano following heavy rain. The composition of almost all lava of the Earth's crust is dominated by silicate minerals, mostly feldspars, olivine, pyroxenes, amphiboles, micas and quartz. Igneous rocks, which form lava flows when erupted, can be classified into three chemical types; felsic, intermediate, and mafic (four if one includes the super-heated ultramafic). These classes are primarily chemical; however, the chemistry of lava also tends to correlate with the magma temperature, its viscosity and its mode of eruption. Felsic or silicic lavas such as rhyolite and dacite typically form lava spines, lava domes or "coulees" (which are thick, short lava flows) and are associated with pyroclastic (fragmental) deposits. Most silicic lava flows are extremely viscous, and typically fragment as they extrude, producing blocky autobreccias. The high viscosity and strength are the result of their chemistry, which is high in silica, aluminium, potassium, sodium, and calcium, forming a polymerized liquid rich in feldspar and quartz, and thus has a higher viscosity than other magma types. Felsic magmas can erupt at temperatures as low as 650 to 750 °C (1,202 to 1,382 °F). Unusually hot (>950 °C; >1,740 °F) rhyolite lavas, however, may flow for distances of many tens of kilometres, such as in the Snake River Plain of the northwestern United States. Intermediate or andesitic lavas are lower in aluminium and silica, and usually somewhat richer in magnesium and iron. Intermediate lavas form andesite domes and block lavas, and may occur on steep composite volcanoes, such as in the Andes. Poorer in aluminium and silica than felsic lavas, and also commonly hotter (in the range of 750 to 950 °C (1,380 to 1,740 °F)), they tend to be less viscous. Greater temperatures tend to destroy polymerized bonds within the magma, promoting more fluid behaviour and also a greater tendency to form phenocrysts. Higher iron and magnesium tends to manifest as a darker groundmass, and also occasionally amphibole or pyroxene phenocrysts. Mafic or basaltic lavas are typified by their high ferromagnesian content, and generally erupt at temperatures in excess of 950 °C (1,740 °F). Basaltic magma is high in iron and magnesium, and has relatively lower aluminium and silica, which taken together reduces the degree of polymerization within the melt. Owing to the higher temperatures, viscosities can be relatively low, although still thousands of times higher than water. The low degree of polymerization and high temperature favors chemical diffusion, so it is common to see large, well-formed phenocrysts within mafic lavas. Basalt lavas tend to produce low-profile shield volcanoes or "flood basalt fields", because the fluidal lava flows for long distances from the vent. The thickness of a basalt lava, particularly on a low slope, may be much greater than the thickness of the moving lava flow at any one time, because basalt lavas may "inflate" by supply of lava beneath a solidified crust. Most basalt lavas are of ʻAʻā or pāhoehoe types, rather than block lavas. Underwater, they can form pillow lavas, which are rather similar to entrail-type pahoehoe lavas on land. Ultramafic lavas such as komatiite and highly magnesian magmas that form boninite take the composition and temperatures of eruptions to the extreme. Komatiites contain over 18% magnesium oxide, and are thought to have erupted at temperatures of 1,600 °C (2,910 °F). At this temperature there is no polymerization of the mineral compounds, creating a highly mobile liquid with viscosity as low as that of water. Most if not all ultramafic lavas are no younger than the Proterozoic, with a few ultramafic magmas known from the Phanerozoic. No modern komatiite lavas are known, as the Earth's mantle has cooled too much to produce highly magnesian magmas. Carbonatite and natrocarbonatite lavas are known from Ol Doinyo Lengai volcano in Tanzania, which is the sole example of an active carbonatite volcano. Iron oxide lavas are thought to be the source of the iron ore at Kiruna, Sweden which formed during the Proterozoic. Iron oxide lavas of Pliocene age occur at the El Laco volcanic complex on the Chile-Argentina border. Iron oxide lavas are thought to be the result of immiscible separation of iron oxide magma from a parental magma of calc-alkaline or alkaline composition. Sulfur lava flows up to 250 metres (820 feet) long and 10 metres (33 feet) wide occur at Lastarria volcano, Chile. They were formed by the melting of sulfur deposits at temperatures as low as 113 °C (235 °F). Olivine nephelinite lavas are thought to have come from much deeper in the mantle of the Earth than other lavas. The term "lava" can also be used to refer to molten "ice mixtures" in eruptions on the icy satellites of the Solar System's gas giants. (See cryovolcanism). In general, the composition of a lava determines its behavior more than the temperature of its eruption. The viscosity of lava is important because it determines how the lava will behave. Lavas with high viscosity are rhyolite, dacite, andesite and trachyte, with cooled basaltic lava also quite viscous; those with low viscosities are freshly erupted basalt, carbonatite and occasionally andesite. Highly viscous lavas do not usually flow as liquid, and usually form explosive fragmental ash or tephra deposits. However, a degassed viscous lava or one which erupts somewhat hotter than usual may form a lava flow. Lavas also may contain many other components, sometimes including solid crystals of various minerals, fragments of exotic rocks known as xenoliths and fragments of previously solidified lava. The physical behavior of lava creates the physical forms of a lava flow or volcano. More fluid basaltic lava flows tend to form flat sheet-like bodies, whereas viscous rhyolite lava flows forms knobbly, blocky masses of rock. General features of volcanology can be used to classify volcanic edifices and provide information on the eruptions which formed the lava flow, even if the sequence of lavas have been buried or metamorphosed. The ideal lava flow will have a brecciated top, either as pillow lava development, autobreccia and rubble typical of ʻaʻā and viscous flows, or a vesicular or frothy carapace such as scoria or pumice. The top of the lava will tend to be glassy, having been flash frozen in contact with the air or water. The centre of a lava flow is commonly massive and crystalline, flow banded or layered, with microscopic groundmass crystals. The more viscous lava forms tend to show sheeted flow features, and blocks or breccia entrained within the sticky lava. The crystal size at the centre of a lava will in general be greater than at the margins, as the crystals have more time to grow. The base of a lava flow may show evidence of hydrothermal activity if the lava flowed across moist or wet substrates. The lower part of the lava may have vesicles, perhaps filled with minerals (amygdules). The substrate upon which the lava has flowed may show signs of scouring, it may be broken or disturbed by the boiling of trapped water, and in the case of soil profiles, may be baked into a brick-red terracotta. Discriminating between an intrusive sill and a lava flow in ancient rock sequences can be difficult. However, some sills do not usually have brecciated margins, and may show a weak metamorphic aureole on both the upper and lower surface, whereas a lava will only bake the substrate beneath it. However, it is often difficult in practice to identify these metamorphic phenomenon because they are usually weak and restricted in size. Peperitic sills, intruded into wet sedimentary rocks, commonly do not bake upper margins and have upper and lower autobreccias, closely similar to lavas. ʻAʻā is one of three basic types of flow lava. ʻAʻā is basaltic lava characterized by a rough or rubbly surface composed of broken lava blocks called clinker. The Hawaiian word was introduced as a technical term in geology by Clarence Dutton. Accretionary lava balls as large as 3 metres (10 feet) are common on ʻaʻā flows. 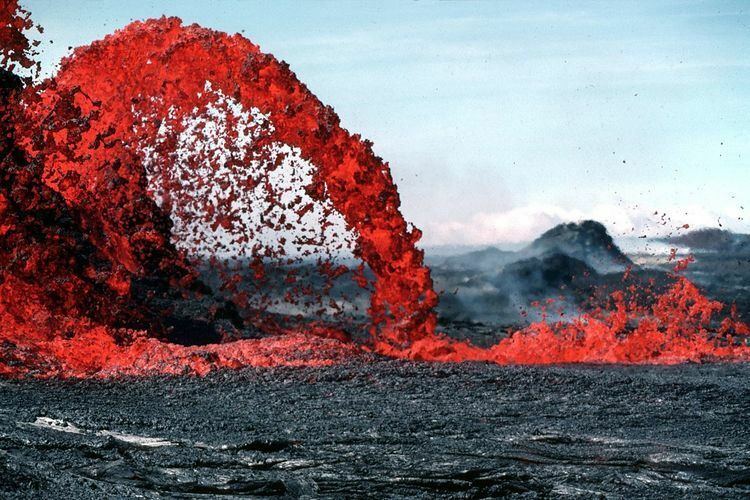 ʻAʻā is usually of higher viscosity than pāhoehoe. Pāhoehoe can turn into ʻaʻā if it becomes turbulent from meeting impediments or steep slopes. ʻAʻā lavas typically erupt at temperatures of 1,000 to 1,100 °C (1,830 to 2,010 °F). The word is also spelled aa, aʻa, ʻaʻa, and a-aa, and pronounced /ˈɑː.ɑː/ or /ˈɑːʔɑː/. It originates from Hawaiian where it is pronounced [ʔəˈʔaː], meaning "stony rough lava", but also to "burn" or "blaze". Pāhoehoe (pronunciation: /pəˈhoʊ.iːˈhoʊ.iː/; from Hawaiian [paːˈhoweˈhowe], meaning "smooth, unbroken lava"), also spelled pahoehoe, is basaltic lava that has a smooth, billowy, undulating, or ropy surface. These surface features are due to the movement of very fluid lava under a congealing surface crust. The Hawaiian word was introduced as a technical term in geology by Clarence Dutton. A pāhoehoe flow typically advances as a series of small lobes and toes that continually break out from a cooled crust. It also forms lava tubes where the minimal heat loss maintains low viscosity. The surface texture of pāhoehoe flows varies widely, displaying all kinds of bizarre shapes often referred to as lava sculpture. With increasing distance from the source, pāhoehoe flows may change into ʻaʻā flows in response to heat loss and consequent increase in viscosity. Pahoehoe lavas typically have a temperature of 1,100 to 1,200 °C (2,010 to 2,190 °F). Most lava flows on the Earth are less than 10 km (6.2 mi) long, but some pāhoehoe flows are more than 50 km (31 mi) long. The rounded texture makes pāhoehoe a poor radar reflector, and is difficult to see from an orbiting satellite (dark on Magellan picture). Block lava flows are typical of andesitic lavas from stratovolcanoes. They behave in a similar manner to ʻaʻā flows but their more viscous nature causes the surface to be covered in smooth-sided angular fragments (blocks) of solidified lava instead of clinkers. Like in ʻaʻā flows, the molten interior of the flow, which is kept insulated by the solidified blocky surface, overrides the rubble that falls off the flow front. They also move much more slowly downhill and are thicker in depth than ʻaʻā flows. Lava domes and coulées are associated with felsic lava flows ranging from dacite to rhyolite. The very viscous nature of these lava cause them to not flow far from the vent, causing the lava to form a lava dome at the vent. When a dome forms on an inclined surface it can flow in short thick flows called coulées (dome flows). These flows often travel only a few kilometers from the vent. Pillow lava is the lava structure typically formed when lava emerges from an underwater volcanic vent or subglacial volcano or a lava flow enters the ocean. However, pillow lava can also form when lava is erupted beneath thick glacial ice. The viscous lava gains a solid crust on contact with the water, and this crust cracks and oozes additional large blobs or "pillows" as more lava emerges from the advancing flow. Since water covers the majority of Earth's surface and most volcanoes are situated near or under bodies of water, pillow lava is very common. Because it is formed from viscous molten rock, lava flows and eruptions create distinctive formations, landforms and topographical features from the macroscopic to the microscopic. Volcanoes are the primary landforms built by repeated eruptions of lava and ash over time. They range in shape from shield volcanoes with broad, shallow slopes formed from predominantly effusive eruptions of relatively fluid basaltic lava flows, to steeply-sided stratovolcanoes (also known as composite volcanoes) made of alternating layers of ash and more viscous lava flows typical of intermediate and felsic lavas. A caldera, which is a large subsidence crater, can form in a stratovolcano, if the magma chamber is partially or wholly emptied by large explosive eruptions; the summit cone no longer supports itself and thus collapses in on itself afterwards. Such features may include volcanic crater lakes and lava domes after the event. However, calderas can also form by non-explosive means such as gradual magma subsidence. This is typical of many shield volcanoes. Cinder cones and spatter cones are small-scale features formed by lava accumulation around a small vent on a volcanic edifice. Cinder cones are formed from tephra or ash and tuff which is thrown from an explosive vent. Spatter cones are formed by accumulation of molten volcanic slag and cinders ejected in a more liquid form. Another Hawaiian English term derived from the Hawaiian language, a kīpuka denotes an elevated area such as a hill, ridge or old lava dome inside or downslope from an area of active volcanism. New lava flows will cover the surrounding land, isolating the kīpuka so that it appears as a (usually) forested island in a barren lava flow. Lava domes are formed by the extrusion of viscous felsic magma. They can form prominent rounded protuberances, such as at Valles Caldera. As a volcano extrudes silicic lava, it can form an inflation dome, gradually building up a large, pillow-like structure which cracks, fissures, and may release cooled chunks of rock and rubble. The top and side margins of an inflating lava dome tend to be covered in fragments of rock, breccia and ash. Examples of lava dome eruptions include the Novarupta dome, and successive lava domes of Mount St Helens. Lava tubes are formed when a flow of relatively fluid lava cools on the upper surface sufficiently to form a crust. Beneath this crust, which being made of rock is an excellent insulator, the lava can continue to flow as a liquid. When this flow occurs over a prolonged period of time the lava conduit can form a tunnel-like aperture or lava tube, which can conduct molten rock many kilometres from the vent without cooling appreciably. Often these lava tubes drain out once the supply of fresh lava has stopped, leaving a considerable length of open tunnel within the lava flow. Lava tubes are known from the modern day eruptions of Kīlauea, and significant, extensive and open lava tubes of Tertiary age are known from North Queensland, Australia, some extending for 15 kilometres (9 miles). A lava fountain is a volcanic phenomenon in which lava is forcefully but non-explosively ejected from a crater, vent, or fissure. The highest lava fountains recorded were during the 1999 eruption of Mount Etna in Italy, which reached heights of 2,000 m (6,562 ft). However, lava fountains observed during Mount Vesuvius' 1779 eruption are believed to have reached at least 3,000 m (9,843 ft). Lava fountains may occur as a series of short pulses, or a continuous jet of lava. They are commonly associated with Hawaiian eruptions. Rarely, a volcanic cone may fill with lava but not erupt. Lava which pools within the caldera is known as a lava lake. Lava lakes do not usually persist for long, either draining back into the magma chamber once pressure is relieved (usually by venting of gases through the caldera), or by draining via eruption of lava flows or pyroclastic explosion. Lava deltas form wherever sub-aerial flows of lava enter standing bodies of water. The lava cools and breaks up as it encounters the water, with the resulting fragments filling in the seabed topography such that the sub-aerial flow can move further offshore. Lava deltas are generally associated with large-scale, effusive type basaltic volcanism. Lava flows are enormously destructive to property in their path. However, casualties are rare since flows are usually slow enough for people and animals to escape, though this is dependent on the viscosity of the lava. Nevertheless, injuries and deaths have occurred, either because they had their escape route cut off, because they got too close to the flow or, more rarely, if the lava flow front travels too quickly. This notably happened during the eruption of Nyiragongo in Zaire (now Democratic Republic of the Congo). On the night of 10 January 1977 a crater wall was breached and a fluid lava lake drained out in under an hour. The resulting flow sped down the steep slopes at up to 100 km/h (62 mph), and overwhelmed several villages while residents were asleep. As a result of this disaster, the mountain was designated a Decade Volcano in 1991. Deaths attributed to volcanoes frequently have a different cause, for example volcanic ejecta, pyroclastic flow from a collapsing lava dome, lahars, poisonous gases that travel ahead of lava, or explosions caused when the flow comes into contact with water. A particularly dangerous area is called a lava bench. This very young ground will typically break-off and fall into the sea. Areas of recent lava flows continue to represent a hazard long after the lava has cooled. Where young flows have created new lands, land is more unstable and can break-off into the sea. Flows often crack deeply, forming dangerous chasms, and a fall against 'a'a lava is similar to falling against broken glass. Rugged hiking boots, long pants, and gloves are recommended when crossing lava flows. Cagsawa, Philippines buried by lava erupted from Mayon Volcano in 1814. The Nisga'a villages of Lax Ksiluux and Wii Lax K'abit in northwestern British Columbia, Canada were destroyed by thick lava flows during the eruption of Tseax Cone in the 1700s. Parícutin (village after which the volcano was named) and San Juan Parangaricutiro, Mexico, by Parícutin from 1943 to 1952. Sale'aula, Samoa, by eruptions of Mt Matavanu between 1905 and 1911. Tephra is volcanic ash, lapilli, volcanic bombs or volcanic blocks. Plymouth, Montserrat, in 1995. Plymouth was the capital and only port of entry for Montserrat and had to be completely abandoned, along with over half of the island. It is still the de jure capital.